Park Tool has developed along with 3M a tube-patch that is self-adhesive and also flexes, stretches, flexes, turns and twists just like the tube. No troublesome glueing, takes very little storage space. Gently scrape the tube using the small piece of included sandpaper. Then, clean the area and apply the patch. That's it! You're all set to hit the road. 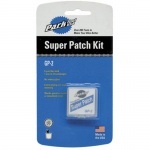 Each Patch Kit from Park Tool includes six tube patches with a piece of sandpaper in a convenient & small storage container. 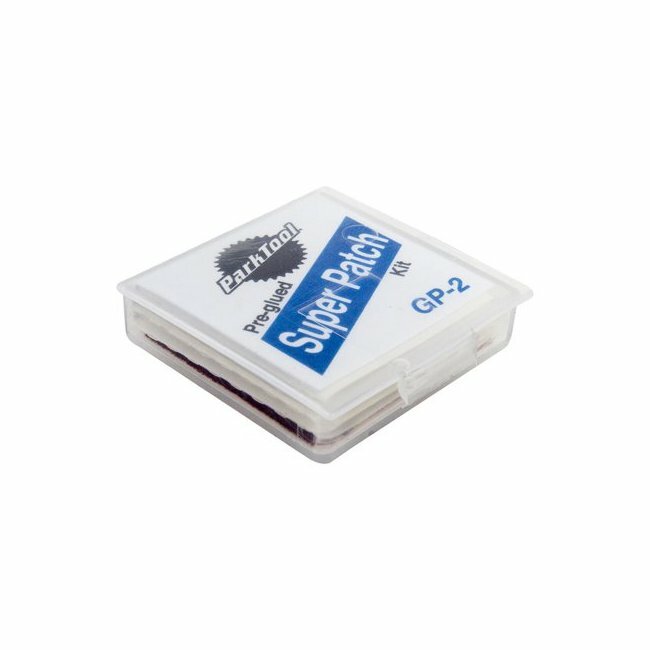 These patches are available as individual items on a card (GP-2C) or in a bulk 48 kit counter-top display that is very handy. Step 1: When repairing a flat-tire, you will first need to find the hole in the tube. For best results, you should inflate the inner-tube to double it's original size. Step 2: Find the leak by listening very carefully for the quiet sound of air hissing from the tube. Move the top of your hand along the entire area of the tube but not quite touching. You may feel a soft jet of air on a sensitive part of your skin. If you are unable to locate any leaks using these methods, submerge the tube in a bucket of water and look for tiny bubbles coming from the hole. Your can also check the valve stem for leaks. Step 3: Now that you have found the hole, you should use an ink pen to mark the hole. Draw a box around the hole but do not get too close or mark on the hole itself because the marks may be accidentally removed in the following steps. Step 4: Prep the inner-tube before patching by cleaning the tube. Use the included sandpaper to gently scrape the area around the hole. If you do not have the included sandpaper, you can use regular sandpaper or an emeryboard. Becareful not to sand it so hard that it leaves any grooves. This can cause the patch to fail! If you can, clean the area with an old rag and either alcohol or another solvent that won't leave an oily residue. Be sure the entire area around the hole is completely dry before proceeding. The patch will not adhere to the innertube correctly unless it is completely dry. 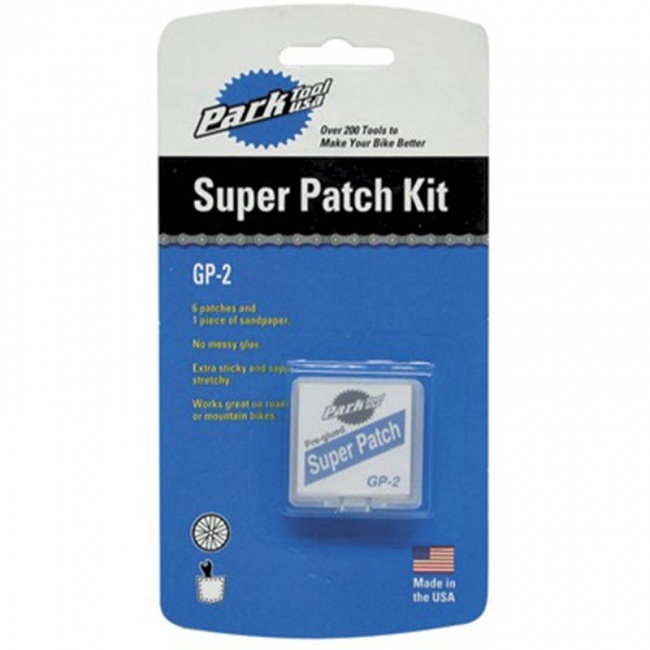 Note: The Park Tool GP-2 "Super Patch Kit" has patches that are pre-glued so you do not need a tube of glue. A. Peel the liner from the back of the patch. Try not to touch the patch too much. Handle it by the edges only. B. Align the patch over the center of the hole then place it on the inner-tube. C. Gently push the tube-patch securely on the tube. Push down on the patch to make sure it is sealed all around. Squish it between your fingers to get a tight seal. That's it! You're now ready to reinstall the tube and hit the road. IMPORTANT: Don't air-up the tube until it is inside the tire. This can cause the tube to stretch and that can cause the patch to come loose and start leaking.